Buy Turkey Super Loto 6/54 Tickets Online - Check Turkey Super Loto 6/54 Lotto Results - Check Turkish Super Loto 6/54 Lotto Upcoming Draw and Jackpot Below - Get All Detailed Information about Turkish Super Loto 6/54 lotto game. Turkey Super Loto 6/54 is a Turkish Lottery game, otherwise called Sayisal Super Loto 6/54. Super Loto 6/54 is a new and very recent lotto game. The very first draw took place on October 2007 year. It seems that, Super Loto 6/54 became one of the most popular and most played lottery games in Turkey. This lotto game is offered to you by the Turkish National Lottery Administration, called Milli Piyango. There is a sister older Turkish lotto game, called Turkey 6/49 Lotto. We also offer this game to play online. Please visit our special page about TURKEY 6/49 LOTO lotto game. Thank you. The Turkish Super Loto 6/54 is a traditional draw-style jackpot lotto lottery game of chance. 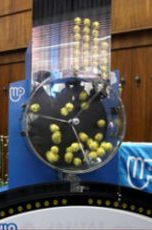 Player need to select 6 unique numbers out of a pool of balls numbered from 1 to 54. You need to match all 6 winning numbers to win jackpot. If you just want to play Turkish Super Lotto 6/54 right now online, please click the link below, choose your lucky numbers, register and play! Good luck!. FREE TURKEY 6/54 SUPER LOTTO TICKET! Buy Turkish Super Loto 6/54 lottery ticket online for the first time, and get 1 ticket absolutely FREE!, as a welcome bonus! Play Now and click below! Jackpots for the Super Loto 6/54 commence at approximately TL1.1 Million and when jackpot is not won, it will rollover and the sum will be added onto the coming jackpot for the next draw. There is no limit to how many times the Super Loto 6/54 can 1st prize will rollover. It will rollover as lomg, as somebody will win 1st prize. This makes this lotto game exciting and brings in larger lottery jackpot figures that can be won. There are some record jackpot produced by the Turkish Super Loto 6/54 game, like– the TL34,150,274 on March 2009 year, after the game rollovered for many weeks. Draws for the Turkish Super Loto 6/54 take place every week on Thursdays at 20:55 Turkish Time. Jackpots are paid in cash and there is 0% tax requirement, as for present day. The odds of hitting the jackpot (six main numbers) in Turkey Super Loto 6/54 Lotto, are 1 in 25,827,165. To give you some imagination, how much you can win in Turkish Super Loto 6/54 lotto, please take a look at the table, at the right. It shows the level of prizes was paid, on example draw of October, 2011 year. This table is for information purposes only. You may check the latest Turkish Super Loto 6/54 Results and Upcoming Draw & Jackpot, right below or at the beginning of this page. Just bookmark or save link to this page for reference. Turkish Super Lotto 6/54 is fun and easy to play online, from any place in the World, using debit card, credit card or other electronic fund transfer, like PayPal or Skrill. All you have to do is to click Buy A Ticket! below, register and play ! You may do this from any place in the world, using computer and internet access. Please click any BUY A TICKET above and buy one lotto ticket online. If you do that for the first time, you will get 1 ticket absolutely FREE ! Play Now ! This service of playing Turkish Super Lotto 6/54 and other lotteries online, was brought to us by a reputable worldwide lottery ticket agent theLotter. 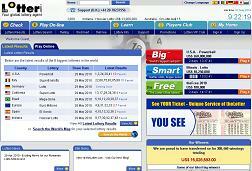 theLotter, offers many ways to buy Turkish Lotto lottery tickets online. Online players can choose to purchase tickets in a single form for, a one specific Turkey Super Loto 6/54 drawing. However, if you are regular lotto player, it will become smarter for you, to buy lottery tickets in multiple drawings. In this case, you have got two options. The first available option is a Subscription. When a player chooses to play with a subscription, their lucky numbers will be entered automatically, in every upcoming drawing for the Turkish Super Loto 6/54 lottery, with every 10th participation FREE. 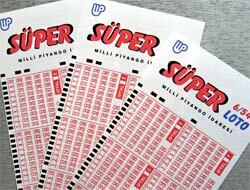 The second option to buy Turkish Super Loto 6/54 tickets to many drawings is to buy a Multi-Draw Form. 5, 10, 25 or 52 consecutive drawings. The advantage of a Multi-Draw form for the Turkey Super Lotto 6/54 is that YOU PAY LESS, for each draw your form participates in.